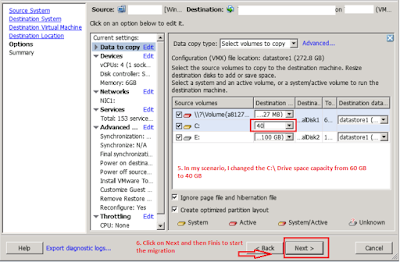 Techies Sphere: How to decrease drive capacity of a Windows OS based Virtual Machine in VMware? 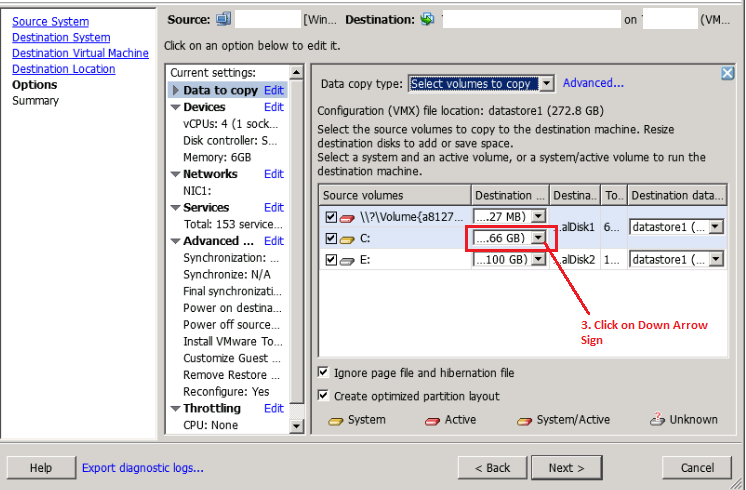 How to decrease drive capacity of a Windows OS based Virtual Machine in VMware? Or, Can we decrease drive capacity of Virtual Machine having windows operating system in VMware? If you are looking for a simple way of decreasing the drive space of a virtual machine as you do for increasing drive space, it’s not there in VMware. So, the answer is NO, we can’t decrease the drive space of a Virtual Machine in VMware but there is a way out of doing it and that is V2V migration of the Virtual Machine. Possibility: For decreasing the drive capacity of a virtual machine you may perform V2V migration of the virtual machine by using VMware vSphere Standalone Converter (use o latest one). If you don’t want your exiting production to be impacted, you may choose to perform V2V migration of the virtual machine in powered on state. 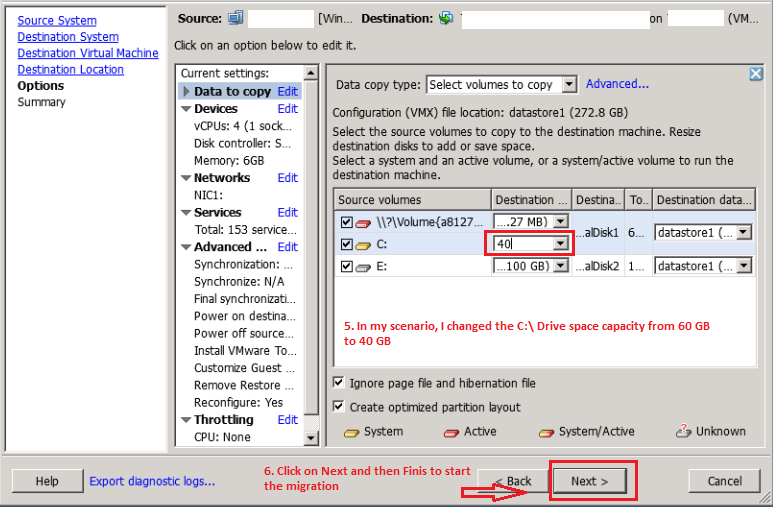 How to do V2V or P2V migration in VMware? 1. Once the Migration is completed, you can check your destination VM’s drive capacity it should be appearing as you have defined the value (in GB) as per last screenshot. 2. In some cases, you may need to re-join your newly migrated VM in domain to make it fully functional. It better you delete the old computer account and then re-join this machine in domain to create a new computer account for this new VM instance. 3. You may need to re-activate the license of the Windows machine after this activity. Cheers, You may write me back for any suggestion or feedback..